Self-Employed in northern California. Specializing in starting young horses, finding solutions for troubled horses and riders, teaching horsemanship lessons to help people enjoy their time with their horses. Horses in training include young hunter/jumper, dressage, three-day eventing, working cowhorse, cutting and reining prospects, endurance, pleasure and trail horses, and rescue projects, including mustangs, racehorses, donkeys and mules. Encouraging Human and equine students of all ages and levels and disciplines of riding. Clients' numbers available upon reference request. I continue to receive lessons in various disciplines with some of my mentors, who have included: John Saint Ryan, Audrey Goldsmith, Manolo Mendez, Klaus Shoneich, Sue Sherry, Cindy Schleuss, Gwen Stockebrand, Klaus Bergener, Mike Beck, Ed Dabney, Leslie Rosenberg, Ollie Galligan, Art Grunig, Diana Field, Bryan Neubert, Ray Hunt, Richard Winters, and others, in an effort to continuously improve and refine my own skills. I have also had the privilege to ride in Patagonia and Egypt, on fabulous Criollos and Arabians, with horsemen of those regions. I would be happy to facilitate trips again to any of the places I have been, or to join you in a new adventure! 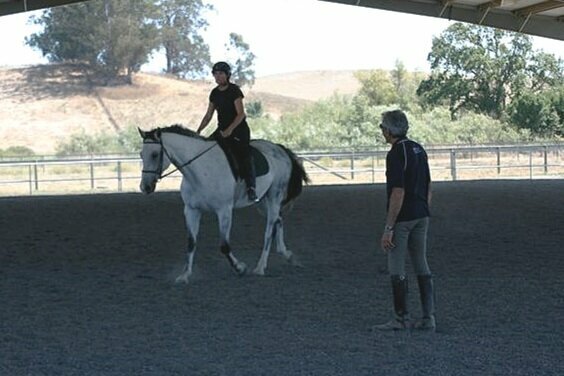 Horsemanship Program Director at the Highland Ranch in Mendocino County. While accepting a limited number of horses in training, I also had the wonderful opportunity to host clinics and invite riders to this luxurious equestrian paradise. I managed the health, training, and safety of up to 30 horses and guests. Assistant to Audrey Goldsmith and Diana Field at Skyview Farm in Sebastopol. I have learned so much from these amazing trainers and the talented horses they have in their barn. I continue to visit Audrey at Sequel Farm in Bend, Oregon for lessons and clinics. Wrangler at the N Bar Ranch. Duties included starting young ranch horses, guiding guests through over 100,000 acres of the Gila Wilderness in New Mexico, working cattle, care of 60 head of horses, including mares and foals. Preston Bates, the owner and manager of the ranch, taught me much by example, told me a few secrets, and left me alone in the wilderness to discover what I could from the back of some wonderful horses. The N Bar is still available for a visit, follow the link above to check them out. Self employed starting horses, helping people with "problem" horses, assisting with hunter/jumper training, teaching beginning lessons, studying Natural Horsemanship, working cattle, and working as a veterinary technician. I appreciate this varied exposure to different horses and owners doing things variable ways. 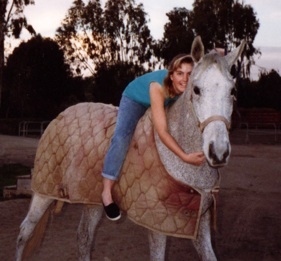 I came across many memorable horses and people who taught me quite a bit. Groom and exercise rider at Triple Rise, Mike Gallaway's hunter/jumper barn, intensive lessons and training. Starting colts, guiding trail rides. Groom at the Grand Prix level, continued training in dressage and jumping. Western riding experience in gymkhana and cow work.